Transvideo's Betz Kit II for CineMonitorHD8 includes a bridge for Betz, a pair of 16mm rods, and a yoke with bridge 89-16. Transvideo's Bridge 89-16 for Betz is used to mount 16mm diameter rods with 89mm spacing on Betz systems. 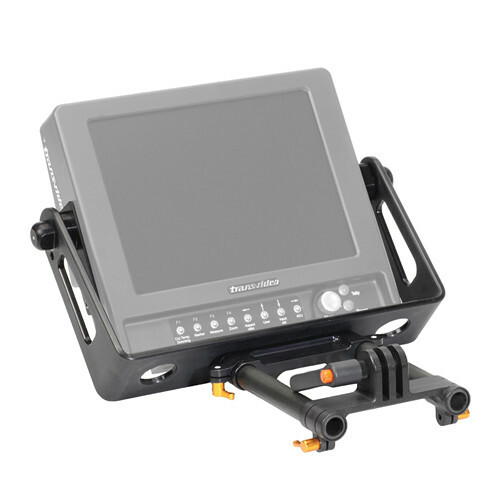 Tranvideo's Yoke with Bridge 89-16 for CineMonitorHD8 is used for mounting a monitor onto a Steadicam. It attaches to the center of gravity of the monitor and uses a constant torque rotating system. The monitor position can be adjusted without any tool. The Transvideo 16mm Rods come in a pair. Each rod measures 5.91” (150mm) in length. Box Dimensions (LxWxH) 6.0 x 1.4 x 0.7"